I heard about Caffey from a friend and thought he might have some good stories to tell. We started talking and he joked about the stories his guitar might tell if it only could. It sounded like a pretty good hook for a narrative, and so this column was published Jan. 4, 2013. 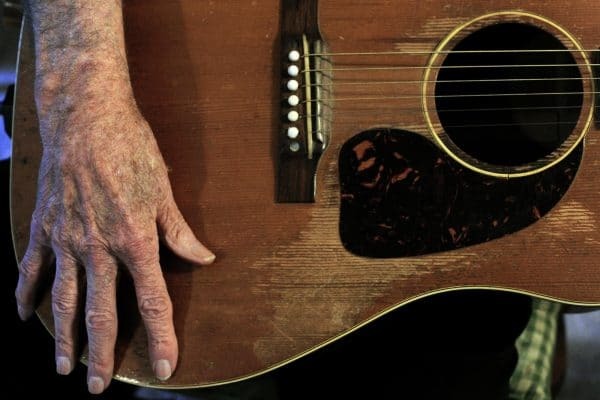 STAMFORD — So what if that old guitar really could talk? If the measure of a man’s life might be reckoned through the tales he spins on an idle winter morning, would the same hold true for his Gibson acoustic? Caffey’s had that guitar so long, he can’t remember when he bought her. She’s been stolen twice, the love of his life, though the guitar always comes in second to his wife, Dorothy. 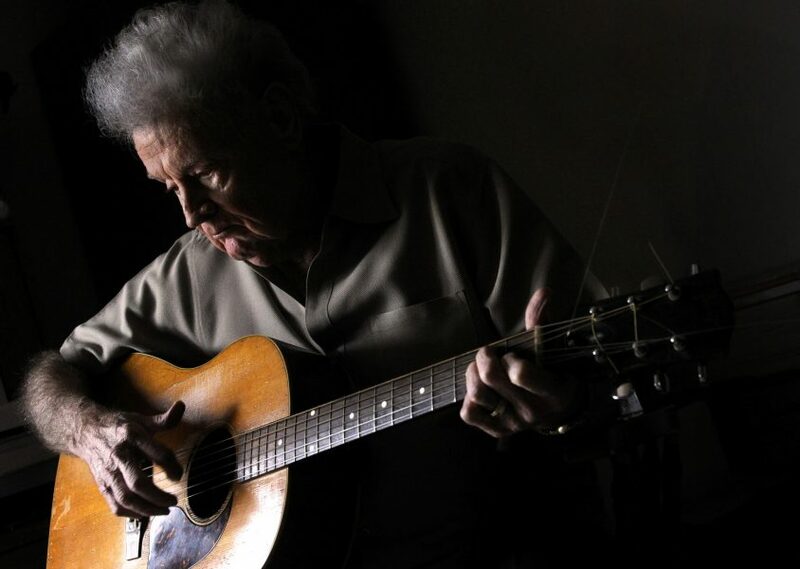 The six-string wasn’t brand-new back in the early 1950s when it came to him. He was 17, climbing telephone poles then for the phone company, just making his way in the world. In Colorado City, the job took him to an alley for a while splicing cable and brought a visitor, too. “An old black man came down the alley and he would stop to talk,” said Caffey. The man was gifted with a weathered face, wearing a cap over his brow and clenching a cigar in his teeth. Caffey remembered the visitor’s love of music. “When he would talk to me, I could tell he enjoyed music to its fullest depth. It was just something in his soul,” Caffey remembered. The man loved the blues, but Caffey was a country boy. Even so, the old bluesman gave what advice he could. “He said, ‘Sonny-boy, if you put a rattlesnake rattler in your ‘git-tar’, it’ll make it sound really good,'” recalled Caffey. He had never heard such a thing before. So he returned to Abilene that weekend and got a rattle. He tossed it through the sound hole to let it roll around inside the guitar’s body. He couldn’t tell a difference, but he kept it in there until it fell out. If that guitar really could speak, maybe it would talk about music. It might remember how Caffey played it in his room at Abilene’s Drake Hotel, now The Grace Museum. When Caffey wasn’t playing, his roommate listened to the coin-operated radio on its stand in the room. No music, however, at Colorado City’s Baker Hotel. “It was right there close to the railroad track and I guarantee you I couldn’t sleep, absolutely. That train sounded like it was coming through the room!” he said. Caffey worked in civil engineering for 43 years. But his passion was music, and he toured with his own band all over the state. In 1968 he opened his own club in Stamford called The Stagecoach Inn, selling it in 1992. Caffey’s guitar and the band were there to pick up the slack if needed. At other times, he and Gibson just sat in. Artists such as Ray Price and Earnest Tubb were regulars at the Stagecoach. The first time Willie Nelson played, he arrived in an old Dodge pickup. The Gibson would surely remember the time she and Caffey were backing Nelson on “Half a Man.” When it came time in the song for the instruments to take the lead, Nelson started negotiating with Caffey over who was going to take the lead and who was going to play harmony, using the guitar to mirror Nelson’s voice. “If I only one arm to hold you/better yet if I had none at all,” Nelson sang, turning over his shoulder between lines to whisper at Caffey. Caffey remembered the last time Willie played for him. Unlike B.B. King, Caffey never named his guitar. His daughter Rhonda did name the shotgun, however. It traveled with the band, too.A sheriff had advised Caffey to arm himself since it was known he usually carried money from his club or other gigs. He had an old sawed-off, pump-action shotgun but he couldn’t just stroll around with it. So he stuffed in a banjo case. “Oh, is that right?” answered a worried Caffey, stomach fluttering. “Yeah, I’m going to look forward to hearing you play that,” the man replied. Thankfully, no banjo request ever came. But some stories did benefit from the Gibson’s silence, especially when it came to telling his wife. Caffey owned a big finned Chrysler and was returning from a gig near New Mexico with his booking agent, Pat. The band had just played a three-night show for an oil company and Caffey couldn’t keep his eyes open. “Pat, I’m just so tired, I don’t feel like driving,” Caffey said. “Son, get in the back seat and go to sleep. I’ll drive us home,” he responded. So Caffey climbed in back with his guitar and dozed. But after a while, something wasn’t quite right. Caffey lowers his voice, imitating his agent’s booming speech. “Don’t bother me boy, I’m sleepin’,” Pat responded. Ah yes, the stories that Gibson could tell.